I have been heavy on the pumpkin this fall, so it only seemed fair to add another cranberry recipe to the roster before we switch gears to winter. I was disappointed to see a lot of cranberry bread recipes calling for canned cranberry sauce. Say what? 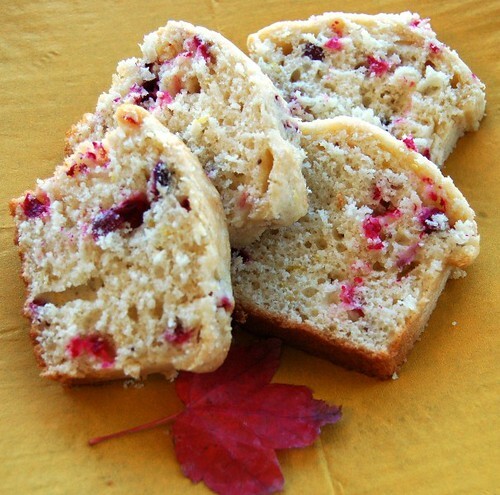 I finally found a nut bread recipe in the Better Homes and Gardens cook book with a variation for cranberry nut bread. I omitted the nuts and swapped out the orange zest for lemon zest. It seems to be an unofficial rule that cranberries go with orange and blueberries go with lemon, but I don’t support that rule. This bread is delicious. 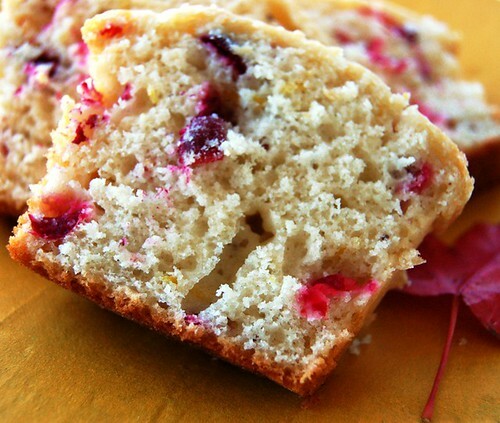 The lemon zest is subtle in both appearance and taste, but definitely balances the tartness of the cranberries. I had actually never baked with fresh cranberries before and I admit I was skeptical when I started chopping them and saw their hollow, teeny-seeded interior…but the end result was delicious. And lovely in color. I am headed to my parents for a few days to celebrate the holiday and visit with family and my mom’s 3 Siamese cats (you may remember them from this post). John will be in Plymouth with his family, and while I am sad that we have yet to spend a Thanksgiving together in 3 years, the history nerd in me can’t argue with someone spending Thanksgiving in actual Plymouth. Or with his terrific family! Of course, my family is wonderful, too. I always look forward to Thanksgiving because it’s an occasion to just sit around the table and visit and eat and tell stories and make each other laugh. I am so grateful to be a part of it. Happy Thanksgiving, everyone! 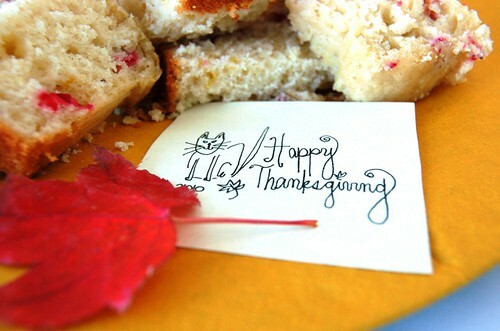 I hope you have a wonderful (and delicious) holiday. Preheat the oven to 350 degrees. Grease your loaf pan or pans of choice (just the bottom and halfway up the sides) and set aside. In a large bowl, whisk together flour, sugar, baking powder, salt, and baking soda. Make a well in the center and set aside. In a medium bowl, combine egg, milk, and oil. Add to dry mixture all at once, and fold a few strokes with a rubber spatula. Add cranberries and lemon zest and fold another few strokes to just combine. Spoon mixture into loaf pan or pans and bake, checking at around 25-30 minutes if using several small loaf pans, and around 45 minutes if making one large loaf. I have found this varies constantly, so I just keep a close eye. Not going to lie…had an overwhelming sense of pride and joy being a homeowner in America’s Hometown of Plymouth, Ma this Thanksgiving! Also this bread looks just delicious!! See you both soon!